Pathé’O – of Burkina origin and Ivorian by adoption – and Sidahmed Alphadi – from Niger –, fashion designers of international renown, pleaded the cause of African cotton, a precondition if the textiles industry in Africa is to flourish. 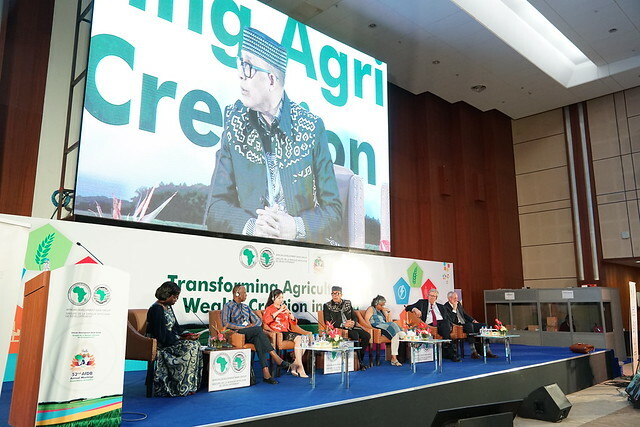 The two African designers voiced these views on Wednesday, May 24, 2017, at the 52nd Annual Meetings of the African Development Bank (AfDB), in the session on “Fashionomics” dedicated to the African textiles and clothing sector. The sector represented a market of US $31 billion in Sub-Saharan Africa. It is even the second most important sector in terms of jobs in some developing countries, after agriculture, according to the AfDB. So how can things be improved? According to him, you need to put an end to the financing disparities which exist in the continent by involving all decision-makers in the sector: “Governments, banks and financial institutions do not help us, especially in the French-speaking area. We do not get much support.” Sidahmed Alphadi complained of the significant differences between parts of the continent: “Things are changing in English-speaking Africa. If our politicians support us, we can create plenty of jobs and develop the textiles market,” he asserted, in an appeal to political leaders. The founder of the “Made in Africa” initiative, Helen Hai, Vice-President and General Manager for overseas investment for Huajian Group, addressed the two African designers, stressing the need for entrepreneurship: “Despite the difficulties, you have to get on with it. You need to be self-reliant. You can start with nothing and create clothes, like in China,” she said. “Creativity is key. You need to adopt another approach, you must create, do something new. Africa’s time has come in this sector with its enormous potential,” asserted Nick Earlam, CEO, Plexus Cotton Group, which specializes in cotton, notably in Nigeria. “It is the textiles industry which will radically change Africa,” he predicted. In Africa, the fashion industry could generate US $15.5 million in five years, according to the AfDB – and these figures are still far from the US $1.3 billion that this industry generates globally. In 2015, to try and fill the gap, in a sector where the overwhelming majority of the workforce consists of women and young people, the Bank launched the “Fashionomics Africa” initiative, designed to provide support to micro, small and medium-sized enterprises (MSME) working in the fashion and textiles sector in Africa. In this context, the Bank has already invested US $10 million in Madagascar, in the investment promotion project (PAPI), which targets MSME in the sector and women and young people in particular. Industrialize Africa – in this case the textiles and clothing sector – is one of the five development priorities of the AfDB, known as the High 5s, to ensure the continent’s economic take-off. The 2017 Annual Meetings of the AfDB Group took place from May 22-26 in Ahmedabad. Over 3,000 delegates, including Heads of State and Government, Ministers of Finance and Heads of Central Banks, attended, alongside representatives of multilateral development finance institutions, development agencies, the private sector, non-governmental organizations, civil society and the media. To find out more about the AfDB’s Fashionomics Africa initiative, click here.